Remember me telling about my missing teeth although they are supposed to be falling off? Well, mom finally found 1 tooth! Here’s a picture to show you poochies how tiny my teeth are…. p/s: anyone looking for a male maltese puppy? We used to love finding Gus’s baby teeth…we even saved all of the ones we could find! 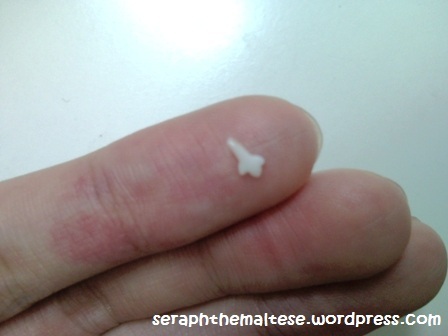 Seraph’s teeth are teeny tiny!